“I think I’ve found it!” she cried exultantly. When my wife looks for kind of trip or holiday, it becomes an all consuming quest. She sits with the laptop for hours searching for exactly the right deal. The object of this particular quest was a long weekend break in order to get away from it all after sustaining a nasty injury at work. My heart sank. 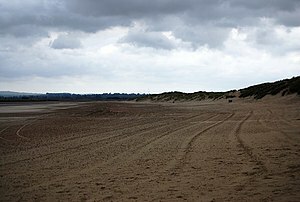 I’d been to Camber Sands a few times. The first was on a family holiday. Just before the halfway point in the holiday, myself and my brother nagged mum and dad so much, they allowed us to go home early on the train. Subsequent visits were for a games convention. The South coast of England in January is not a very hospitable place, particularly if your accommodation is made of a material flimsier than cardboard. One year, I slept in my car. At least it had a heater that worked. So I didn’t have high hopes for the upcoming trip. Julie’s disabled mother came with us so we put in a special request to be on the ground floor close to the main centre. When we arrived, our chalet allocation was on the other side of the park and on the first floor. We complained and were given a different chalet, still on the other side of the park, but at least it was on the ground floor. We opened the door, to be hit by a waft of stench and a sea of filth. Back we went and swapped again. The third chalet had an ant infestation. We agreed that I should go back to the centre this time. Julie had a murderous look in her eye, so if she went, our new accommodation would probably be at Her Majesty’s pleasure. Part of me thought the comfort level might improve. After explaining the problem, the lady behind the counter told me with a smile on her face that I was in the wrong place. I needed to report the problem to the estates hut on the other side of the camp. Off I trudged and joined the long queue outside the aforementioned hut. Eventually, someone turned up with a canister of ant powder. We had to laugh. There was probably one grain of ant powder for every ant in the chalet! We still had a good time, but I am never, ever going there again! According to Reuters, approximately, we produce 14 billion bullets annually. That’s enough to kill everyone on the planet twice over. Seeing as we are all still here, a statistician might tell you that bullets are a woefully inefficient way to kill someone. According to the World Health Organisation, 1.2 million people are killed annually on the world’s roads. Seeing as there are a mere 60 million cars produced a year, choose a car if you want to off someone. Or you could just leave them be. They are 1,500x more likely to die from cancer or 3000x more likely to die from heart disease. Every time my Grandad saw statistics on accidents caused by drunk drivers, he used to make a quip that all drivers should be drunk whilst behind the wheel. After all, if 20% of accidents are caused by drivers who are under the influence, we could eliminate the other 80% if everyone was drunk. I think even a statistician would spot the error in that analysis. Every day, newspapers are full of stories backed up by statistics but how do we know they haven’t just done the same analysis as my Grandad and got the complete wrong end of the stick? Everyone fills in surveys. In the UK, we are required to fill one in by law every 10 years – the census. I’m always amazed at how banal the questions seem. As I think it’s important for the government to have good information about the population, I take it quite seriously. I take care over my answers to make sure they are correct. Many people don’t. Everyone should, as there are harsh penalties for those who provide incorrect information and yet the 4th most popular religion in England and Wales in the 2001 census was Jedi. If I fill in surveys other than the census, I tend to start with good intentions but then halfway through, there will be a question that seems utterly ridiculous or invasive and from that point on I either give up, or it becomes a box ticking exercise that I don’t take much care over. And yet, it is precisely these surveys that form the bedrock of many of the statistics we are bombarded with. It’s worth remembering that when you read some exhaustive analysis on why people who play Angry Birds are more likely to drink strawberry milkshakes. After all, 78.4% of statistics are made up on the spot. No-one really knows agony like an England football supporter. The last time the country won a major international football tournament was 46 years ago, before I was even born. On the eve of their first group match for Euro 2012, for the fans, it’s time to take a big deep breath and brace ourselves for what’s to come. I’ve seen enough tournaments now to know how the story goes. In the build up to a major tournament, there will usually be some kind of managerial crisis. Invariably a foreign man who gets paid more in a year than most people earn in a lifetime suddenly decides that it’s all been too much and they would rather go and do something easier. Then a pause whilst FIFA contemplates its navel for a while before the announcement of the next high-profile name to bring glory to England. I certainly don’t envy them the task. Nor do I envy them the inevitable attention of the tabloid media. The qualification process usually goes fairly well. 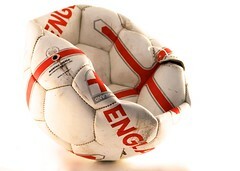 Many teams would be highly envious of England’s record in the games leading up to the Euro or the World cup. As we get closer to the main event, things start to unravel. There will be at least one dressing room scandal. One player or another will succumb to “dodgy ball control” and end up sleeping with another player’s wife / girlfriend / sister / mother and the whole team will be thrown into disarray. Just before squad gets announced, there will be a flurry of injuries. At least one of them will be a broken metatarsal. All of them will be players seen as crucial to England’s chances in the tournament. The England team have always been a bit asymmetrical and the manager will come up with some new wacky and zany formation just so he can accommodate the plethora of talent in the middle. The group stages will be agonising. Somehow the team will limp through but not without another injury and the star player earning a red card. Inevitably, they will finish in the wrong place in the group meaning that they face the strongest teams in succession in the knockout stages. This is when we all start to feel false hope. We dismiss the poor performance so far as nerves and the team getting used to a new formation. We start to think we are only a handful of games away from glory. Surely it must be our turn this time? Then the real agony begins. We come out in red strips for the first game – always a good sign. Our hopes soar with an early goal putting us into the lead which is good because we kid ourselves that we always win if we score first. If the other team scores first, that’s OK too. Some of our greatest victories have suffered the odd hiccup – remember Dunkirk? But before too long the inevitable happens. We crash out of the tournament and all the fans sink into the pits of despair. Only to do it all again next time.